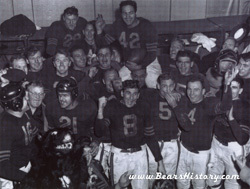 The 1946 Bears celebrate their final championship of the decade following their win over the New York Giants. It was George Halas' plan that the names Shaughnessy, Luckman, Bulldog, Osmanski, McAfee and others would change the face of his team forever. Pehaps Halas couldn't even imagine how fast the turnaround would come, and to what positive extent. The fabulous draft of 1939, that added quarterback Sid Luckman, running back Bill Osmanski, guard Ray Bray and others was reprised in 1940. With their first two picks they picked center/linebacker Clyde "Bulldog" Turner and end Ken Kavanaugh. They also traded with the Philadelphia Eagles for first-round running back George McAfee. McAfee would add some "lightning" to Osmanski's "thunder". Through the first eight weeks of the '40 season, the Bears were 6-2 and set for a showdown with George Preston Marshall's Washington Redskins. On that November 17th in Washington, Chicago lost 7-3, and Marshall was quoted in the paper as calling Halas and his Bears "front-runners," "quitters" and "crybabies". Using Marshall's printed words as a catalyst, Chicago scored 78 points in its final two games. Chicago and Washington's records set up an NFL Championship Game showdown in Washington on December 8. Prior to the game, Halas distributed clippings of Marshall's comments to his players, and said "Gentlemen, this is what George Preston Marshall thinks of you. I think you're a great football team, the greatest ever assembled. Go out on the field and prove it." Fifty-five seconds into the game, Osmanski swept left and scored on a 68 yard touchdown. Late in the game, the officials pleaded with Halas to not kick for extra points as they were running out of footballs that had flown through the uprights into the crowd. In the end, the score was 73-0, the largest margin of defeat in NFL history. After his team had proven to Halas that they were one of the best assembled ever on that day, in the following years they made good on showing that they were indeed perhaps the best every to that point. In 1941, the Bears finished 10-1, losing only to the Green Bay Packers by two points. In a playoff game prior to the NFL Championship, Chicago paid the Packers back, winning 33-14. Then a second championship in a row was secured for Chicago with a 37-9 victory over the New York Giants at Wrigley Field. That game was played under sobering circumstances, two weeks after the Pearl Harbor attack, and players had to have known that the coming years would not be the same. Indeed, as was expected, current players were drafted into the military and at the same time the talent pool of potential players was diminished. The Bears continued operations normally, although some other teams were forced to merge or fold during the war. For example, the Philadelphia Eagles and Pittsburgh Steelers merged to form the Phil-Pitt Steagles. Chicago did lose something significant when founder/coach Halas entered the Navy for a tour of duty in the Pacific theater. Following the October 25, 1942 victory over Philadelphia, Chicago's twelfth victory in a row, Halas turned his team over to assistants Hunk Anderson and Luke Johnsos. The Bears would win the final six games that season-giving them 18 straight regular and postseason wins-but lost the 1942 NFL Championship game 14-6 to the Redskins. In 1943, former star fullback Bronko Nagurski was coaxed back onto the team to play one final season. He played the season mostly at tackle, but did turn in several unforgettable performances at his old role of fullback before the year was over. On December 26th, a visiting Halas returned in his dress Navy uniform to soundly defeat the Redskins 41-21 for their third NFL title of the decade. The story of Nagurski's return to football has been written in Jim Dent's book Monsters of the Midway. The book is currently being made into a feature film. In 1944 and '45, the war continued to erode the talent pool of the Bears as well as the rest of the NFL. Chicago finished 6-3-1 in '44, and 3-7 in 1945. The return of the Bears' stars at the end of '45 was evident, however, as the team did finish 3-2 over the final five weeks of the season. The 1946 season became the final championship season of the decade, as many of the great players from 1940-41 made it back to the team following the conclusion of World War 2. The Bears defeated the New York Giants in New York 24-14 to seal their fourth NFL Championship in seven years. Chicago remained competitive through the end of the decade, compiling a 27-9 record from 1947-'49, but could not win another championship. Talent was still there, however, and the looming 1950's promised to be another exciting era for the Bears. The 1940's were the Chicago Bears' best decade. They won four world championships in the 10 year period. The 1942 Bears had an undefeated regular season, as they did in 1933. Also as they did in '33, they lost the NFL Championship game. Many of the league's stars fought in World War II. An aging Bronko Nagurski was brought back to play in 1943.